Two summers ago, at the first Fiber Festival in Crystal Lake, I took a workshop in weaving on one of those tiny little square looms. It was fun and entertaining, but of course anything that small is really only useful for sampling (since I’m not about to make a bunch of small squares to sew together). Soon after I happened to be at a yarn shop in Richmond, and somehow this came up. The store owner persuaded me to purchase an Easy Weaver loom, which proceeded to sit in its box, unopened, until a few weeks ago. 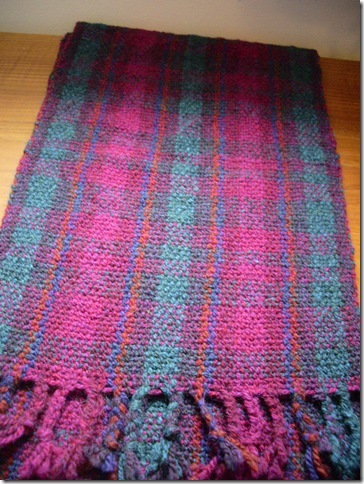 I finally pulled it up and set it up – it comes pre-warped, in this case in a tartan warp pattern in 2 ply wool. 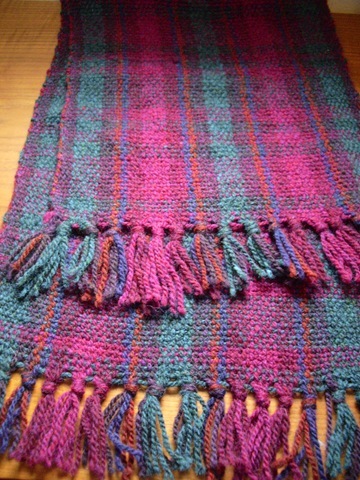 When I finished the first scarf, it remained on the loom – I left space for a fringe, wove a 6 row ‘header’, left another space for fringe, and resumed weaving. 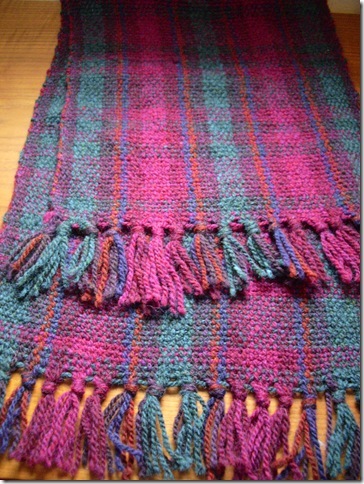 The second was also about 50” with the same weft, but this time I wove a 3/5/8/5/3 pattern and braided the fringe. It was an interesting exercise and I think I learned a lot about how it works, and my likes/dislikes . Weaving is fast! 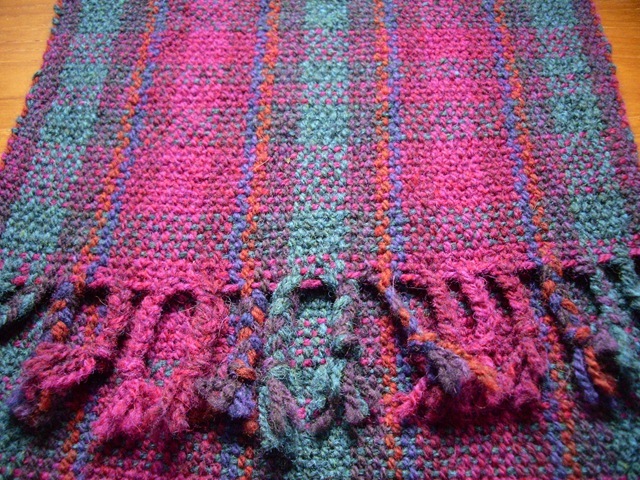 I was able to find and correct some errors while weaving, others are still there. At first I was cutting the yarn at each change, but of course that meant ends to weave in – so I quickly figured out how to carry the yarn along the selvedge, which I liked much better. My selvedges are a bit uneven, but not as bad as I feared – I think they evened out a bit in the wash. The warp shows much more than I would have guessed. I like the 3/5/8 pattern better than the 3/3/10 one, but I prefer the loose fringe to the braided. 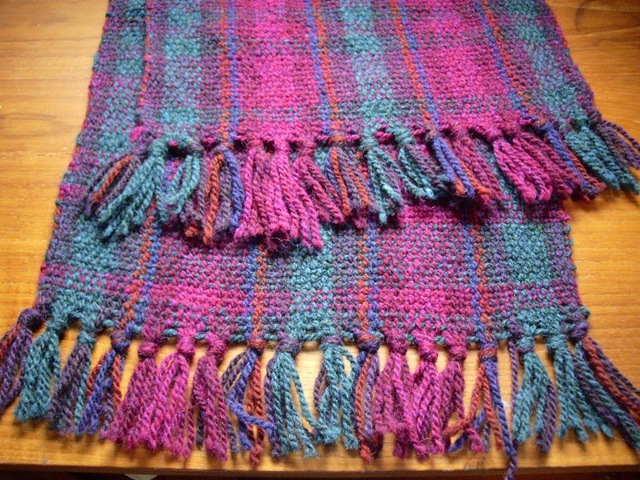 I made the mistake of washing the entire fabric in one piece right after pulling it off the loom – I should have cut it and tied the fringes, and fixed any errors, first, as they weren’t particularly correctable after. 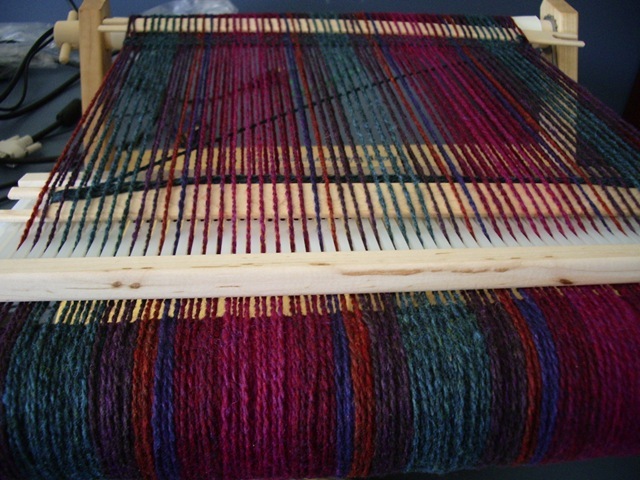 I liked that the loom came pre-warped, as it let me weave first and leave learning warping for later. It was frustrating though to find multiple knots in the warp, as well as one break. 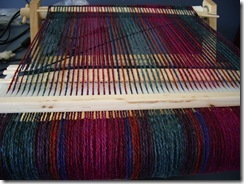 Unlike a more-typical RH loom, the Easy Weaver uses velcro to hold the warp ends on the front and back beams. That does seem to give less loom waste (though there certainly was some!) and struck me as rather clever. Still, as I am reading a book about basic weaving, I can already see why this is considered an ‘educational toy’ (something that escaped me when I purchased it, unfortunately) — it has heddles of course, and a shed and shuttles, but no dents nor treadles. 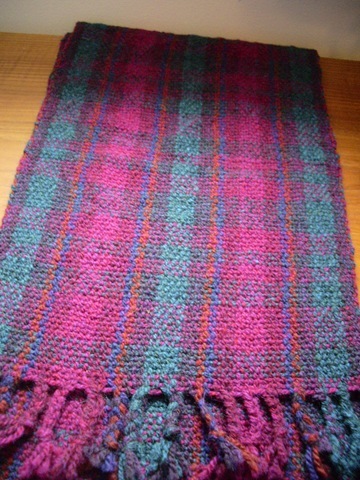 For learning the basics and deciding if I like weaving at all, it is fine – but as I could have purchased a more complex/complete rigid heddle loom for not a lot more, I’m a bit sorry I hadn’t done some research first. 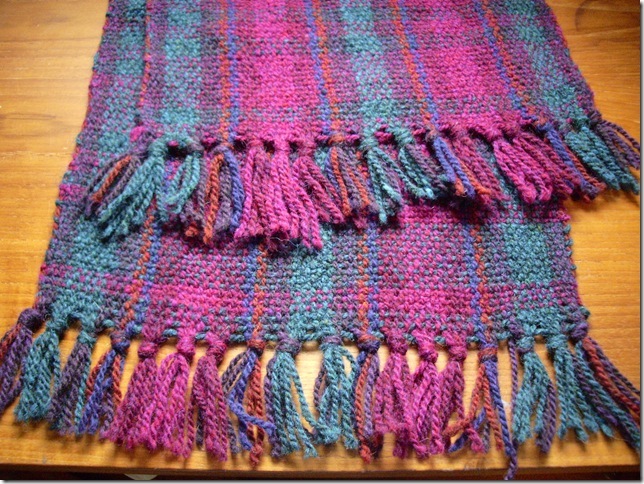 Still and all – I think I would like to take some classes using different types of looms before I consider an additional or replacement loom – it’s apparent that the difference in loom types is considerably more meaningful in terms of what you can do than I have thus far found with spinning wheels! Michelle, this is BEAUTIFUL! And it’s so cool how much you are learning. Plus Ms. Sun in Libra, Ms. Moon in Libra here LOVES the colors you choose. Bravo!!! Thanks! I enjoyed it very much Much as I like them I can’t take credit for the colors though, it was the initial project that came with the loom. /sigh Why yes, it is! Fixed!